Southwest Virginia: "Geography of Virginia"
The southwestern edge of Virginia is Cumberland Gap today, but Virginia once stretched much further west. After Virginia ceded its western land claims to the new national government in the 1780's, the southwestern edge of the state was on the Mississippi River. 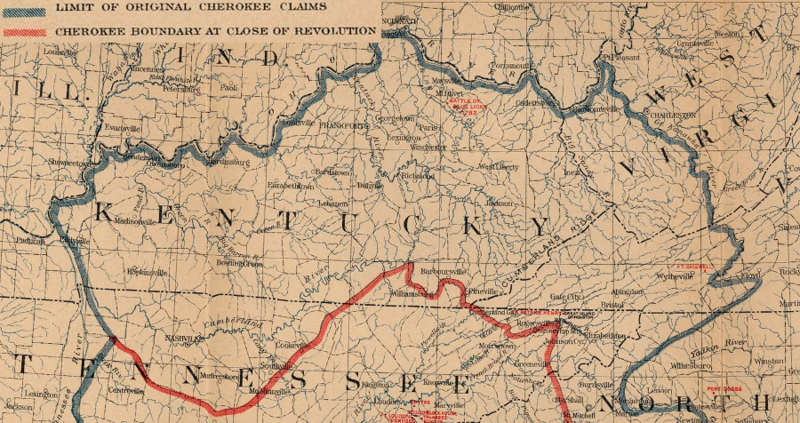 Kentucky became an independent state in 1792, so at that point Virginia no longer included the Cumberland River watershed west of the Allegheny Front. The shape of Virginia's western boundaries changed again after West Virginia became an independent state in 1863, leaving only a tiny portion of the Levisa Fork, Big Sandy, and Tug Fork watersheds in what became Southwest Virginia. Not all of the Virginia mountains are in the southwestern part of the state, but the mountains there are a key feature of the landscape and create a significant barrier to travel. Topography causes the rivers run the "wrong" way. Most of Southwest Virginia is in the Tennessee River watershed. When European settlers first occupied the region in the 1700's, relatively-cheap shipping by water required a long journey to New Orleans rather than to the Chesapeake Bay. If you consider Pulaski, Giles, and Bland counties to be "Southwest Virginia," then the region includes the New River watershed. Like the upper tributaries of the Tennessee River (the Holston, Clinch, and Powell rivers), the New River drains away from the Atlantic Ocean to the Gulf of Mexico. One way to define the boundaries of Southwest Virginia is by the Eastern Continental Divide, placing all the lands west of the divide in Southwest Virginia. Montgomery County is split by the Eastern Continental Divide running through the county. The Virginia Tech campus is in the New River watershed, but portions of Blacksburg on the other side of Main Street are in the Roanoke River watershed. If you think Virginia Tech and Blacksburg are in Southwest Virginia, rather than Southside or the Shenandoah Valley or some other region, then you may be a "lumper" who includes Roanoke in Southwest Virginia too. Another option for setting a boundary for Southwest Virginia is to define it as the region west of the Blue Ridge and *not* in the Chesapeake Bay watershed. The Roanoke River runs to Albemarle/Pamlico Sound rather than to the Chesapeake Bay. 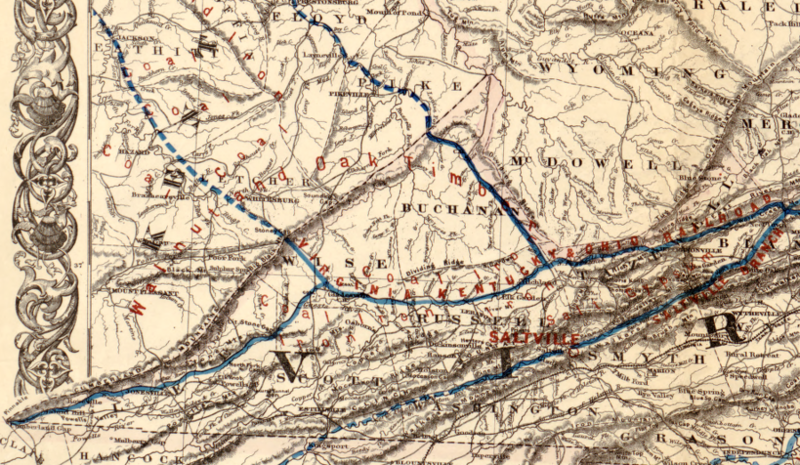 It was not until the Virginia & Tennessee Railroad connected the region with Lynchburg in 1852 that crops and goods produced west of the Blue Ridge and south of the James River could be transported easily to the Fall Line cities of Richmond and Petersburg. 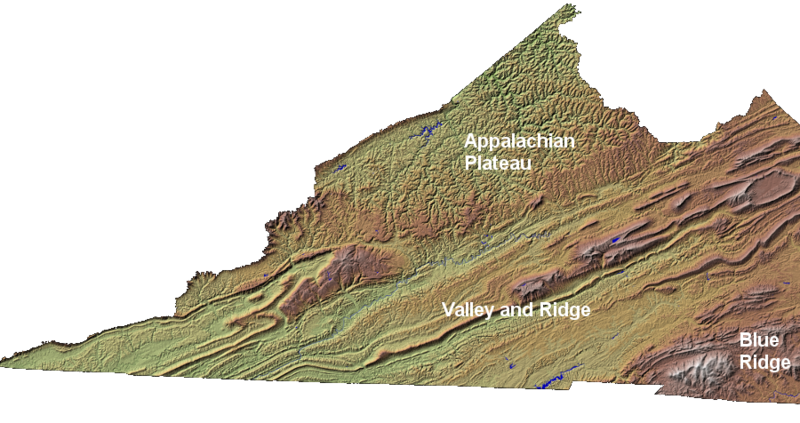 A "splitter" who prefers a narrow definition of specific regions of Virginia could restrict the definition of Southwest Virginia to the Appalachian Plateau. That would limit the region to Buchanan, Dickenson, and a portion of Wise counties. However, this narrow interpretation might be a better definition for Appalachia rather than Southwest Virginia. According to the Southwest Virginia Cultural Heritage Commission, however, modern "Southwest Virginia" includes Bland, Buchanan, Carroll, Dickenson, Floyd, Franklin, Giles, Grayson, Lee, Montgomery, Patrick, Pulaski, Russell, Scott, Smyth, Tazewell, Washington, Wise, and Wythe county, plus the cities of Bristol, Galax, Norton and Radford. 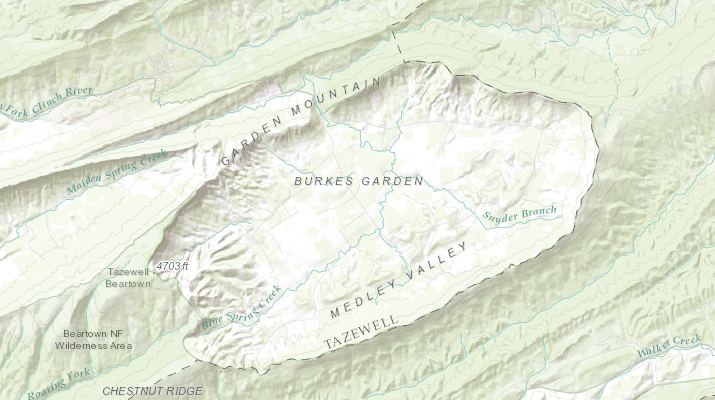 Southwest Virginia includes Burke's Garden, one of the most biologically-rich areas of the state. A unique family of salamanders have evolved in the region too, the Plethodontids. Since the area was never glaciated and it has been at the crossroads of various plant and animal migrations in the last 200 million years, a flora and fauna of great variety have evolved in the region. The greatest concentration of endangered species in Virginia now is the clams and mussels of the Tennessee River watershed. The Great Smoky Mountains National Park, south of the Virginia border, preserves the biodiversity most effectively. Degraded water quality, disturbance of the river bottom, and now invasive species threaten the biological diversity of the region. Farming in the river valleys, harvesting timber on the hillsides, and mining coal on the plateau have changed the habitat dramatically in the last 250 years. Burkes Garden is known sometimes as "God's Thumbprint"
Southwest Virginia is at the headwaters of the Tennessee River watershed. 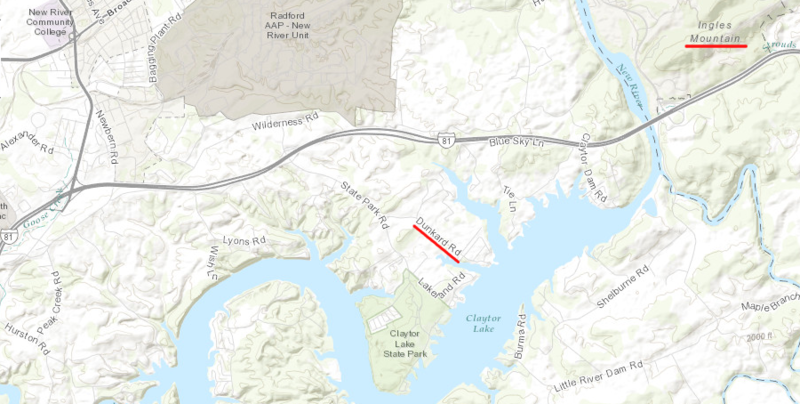 The Powell and Clinch rivers are only marginally navigable, and never became major transportation corridors. The Holston River was used to ship large quantities of salt from Saltville to Kingsport, Tennessee. 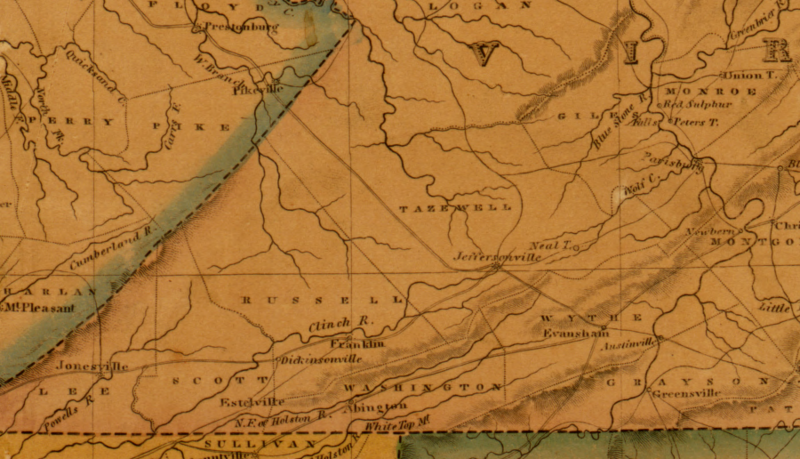 Southwestern Virginia was far from Jamestown, and far from Philadelphia. Not surprisingly, it was slower to develop than eastern Virginia or the Shenandoah Valley. Even today, Virginia's 5 largest cities (Virginia Beach, Norfolk, Chesapeake, Richmond, and Newport News) are on the James River between the Fall Line and the Atlantic Ocean. It was not until the 1740's that settlers like the Ingles and the Draper families settled on the New River near modern-day Blacksburg. "Dunkards Bottom" was named after the religious group that found freedom to worship on the frontier, as well as economic opportunity. The frontier heritage of the region is still evident today in its religious patterns. 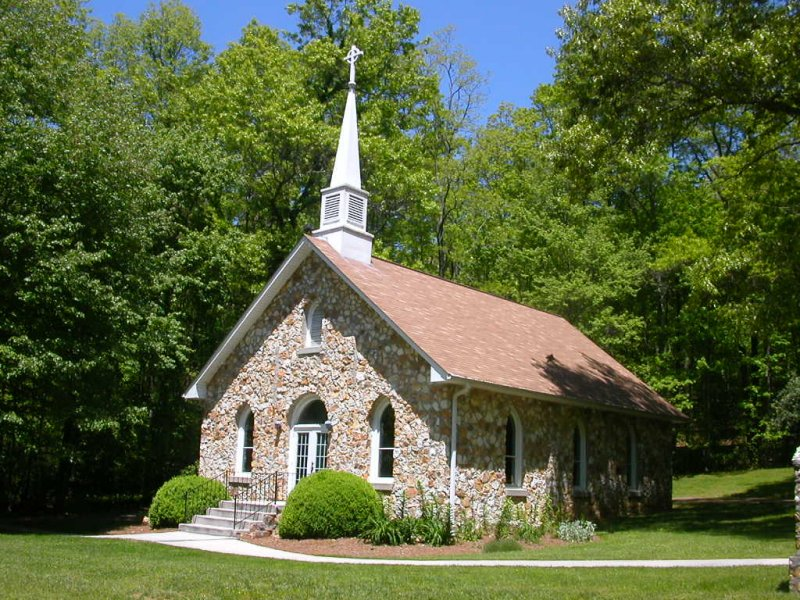 Baptists of various "flavors," and independent churches not associated with any denomination, are the most common religious organizations in the region. The isolation of the region has shaped its people, but also limited its growth and economic development. The coal production of the Appalachian Plateau counties of Wise, Dickinson, and Buchanan was delayed while coal fields closer to markets were brought into production. The Pocahontas coal field in Tazewell County was 100 miles closer to Richmond and the ultimate export port, Norfolk. To the west, Kentucky coal in Middlesboro was closer to the Ohio River. 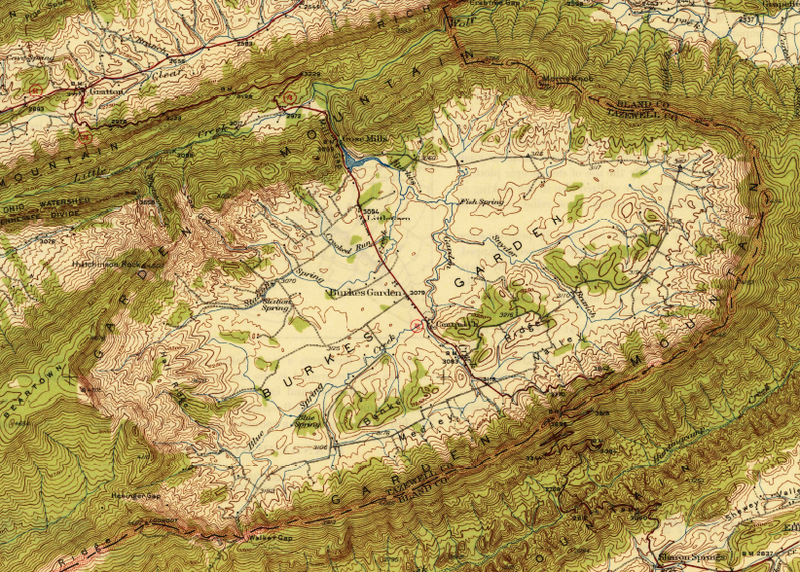 Southwest Virginia was a primary destination, a place to settle, between 1750-1800. In that period, valleys between the ridges were converted from forest to farms. The region became a destination for capitalists and their hired labor between 1880-1920, when the timber and coal barons "harvested" the natural resources and shipped coal and timber to cities in the northern states. Southwest Virginia has also been "on the way to somewhere else," when immigrants followed the Wilderness Road through Cumberland Gap to the fertile Bluegrass Region of Kentucky. Travel was greatest between the end of the French and Indian War (1763) and the Louisiana Purchase (1803). Prior to 1750, settlement was limited to the Shenandoah Valley and the North Carolina Piedmont. At the end of the period, the Ohio River offered a better transportation route westward. When Meriwether Lewis left the East Coast for his exploration to the Pacific Ocean, he floated down the Ohio River from Pittsburg to meet William Clark at the Falls of the Ohio, modern-day Louisville. There was no realistic option to carry the expedition's goods by wagon through Cumberland Gap. Clifton Forge 4,289 no longer incorporated as "city"
Why is the region so rural - or to ask the question from the other direction, why would urban areas get established in Southwest Virginia? The distance to markets is relatively far, so there has been little reason for people to settle there. Once the transportation costs are incorporated into the price, any agricultural or manufactured goods produced in the region are more expensive for potential buyers. Transportation into and out of Southwest Virginia was severely restricted until the railroads were built into the coal fields in the 1890's. The Wilderness Road was created as a southern extension of the Great Philadelphia Road. Daniel Boone's family followed it to the upper Piedmont of North Carolina, and then Boone himself carved the path over the Cumberland Gap and into the bluegrass country of Kentucky. It was a long journey to New Orleans down the Tennessee River, and a shorter walk to the Bluegrass Country of Kentucky. The people who do live in Southwest Virginia did not concentrate into just a few locations. Natural incentives for urban development are rare. There is no Fall Line west of the Blue Ridge, no reason for population to expand at one place because shippers needed warehouses and a labor force there to shift modes of transportation from wagon/canal boat/railroad to transatlantic ship. The New River has some waterfalls, but the industrial potential from waterpower was marginal. One place that did utilize a waterfall on the New River is Fries in Grayson County. It started as an industrial center using New River waterpower to manufacture textiles. Radford also took advantage of the hydroelectric potential by constructing a dam at the mouth of the Little River, a tributary of the New River. Later, what is known today as Appalachian Power built Claytor Lake Dam. That pre-World War Two project is still a major source of electrical power. Southwest Virginia does have valuable mineral deposits, and developing them has created some population centers. The salt deposits at Saltville made that site a target for Yankee raids in the Civil War. Since processing the brine required just simple tools and skills, there was no reason for a large community to grow there. Lead deposits at Austinville in Wythe County were easy to extract and process. A shot tower remains from the days when bullets were produced in mass, but much of the lead was sold as raw ore to the end users who then molded it into bullets as needed. Iron furnaces were industrial plantations prior to the Civil War. The Iron Mountains on the northern edge of Grayson County supplied charcoal-fired furnaces with the ore for producing pig iron, but each furnace was essentially a small iron plantation rather than the core of an urban center. Coal was transported away from the area, literally fueling the growth of East Coast and later Ohio River cities rather than spurring development in Southwest Virginia. 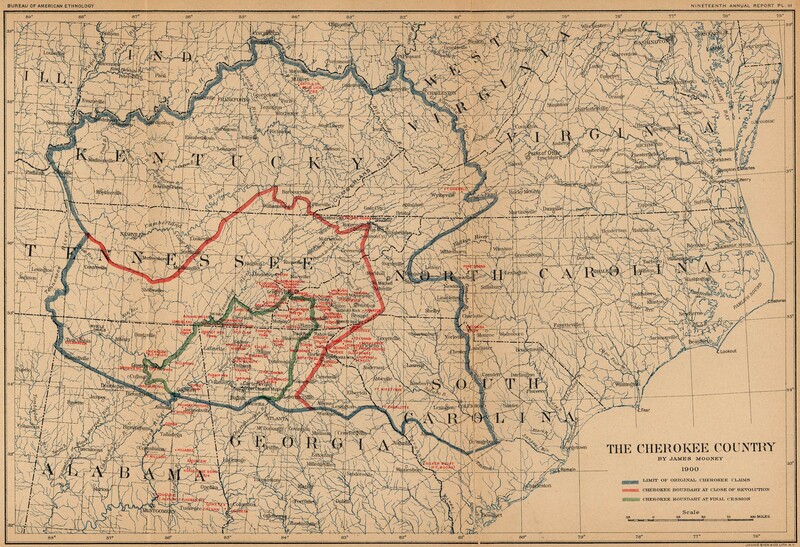 Little of the coal and timber wealth of Southwest Virginia stimulated growth with the region itself. Virginia places that did grow as a result of Appalachian coal were port and railroad towns between the Appalachian Plateau and Hampton Roads. Norfolk and Newport News saw more economic benefit from coal mining than Tazewell, Buchanan, Dickenson, and Wise counties. Roanoke was known as the Magic City for its rapid development. The initial growth spurt stimulated by the Norfolk and Western Railroad was enhanced later by the Virginian Railroad. The Chesapeake and Ohio (C&O) Railroad triggered development at Bluefield and Clifton Forge to support hauling coal to its preferred port at Newport News. Coal traffic was so heavy that the C&O even built a railroad trestle along the James River shoreline in Richmond to bypass the congestion. That trestle is one piece of visible evidence today that the mineral wealth of Southwest Virginia spurred development outside the region. The lack of transportation improvements by the General Assembly, prior to the Civil War, left Southwest Virginia isolated from the rest of the state. In the 1829-30 Constitutional Convention debates, the political debate in Virginia was clearly divided by region rather than political party. Virginians living west of the Blue Ridge objected to the unbalanced funding of "internal improvements" that benefitted primarily Tidewater Virginia, and to the unfair representation of Eastern Virginians in the General Assembly. From the creation of the first counties in 1634 until the Virginia Constitution was revised in 1869, each county elected two representatives to the House of Delegates in the General Assembly. There were many small counties in the Tidewater region of the state, so a resident of Tidewater Virginia had more "clout" in the legislature than a resident west of the Blue Ridge. Eastern Virginians had articulated the concept that fair taxation had to be based on fair representation during the American Revolution. Still, the Tidewater planters had their self-interests to consider. They feared that westerners would change the tax structure of Virginia so slaves, a "property" held primarily by Easterners, would be taxed more heavily to support internal improvements in the western region. Control of the General Assembly allowed the easterners to maintain low property taxes on slaves, requiring a relatively high property tax on land so the state could finance government operations. Thus two Virginians with the same total value in property could end up paying significantly different taxes. Easterners who had their assets in slaves paid less taxes on their property than westerners with the same total value of property, but who owned primarily land. Westerners thought that the east should invest in improving transportation west of the Blue Ridge, because over time the entire state would benefit. This argument failed in a General Assembly dominated by easterners. The western counties then pushed in the Constitutional Convention for a different electoral process, one where the numbers of white men in an area would determine the number of representatives elected to the General Assembly. After changing the composition of the General Assembly, they hoped to change the tax structure. In the 1850's, Governor Henry Wise, an easterner from Accomack County, sought to overcome the sectional split within Virginia. He wanted east and west to agree and for the South to present a solid front against the Northern states. Wise advocated building railroads and roads to connect the Southwest with Tidewater. Western Virginia as well as Eastern would have slaves, slavery would become more diffused, our interests would be at once more homogeneous and they could not tax us without equally taxing themselves. The railroad acomplished what Wise predicted. Farmers recognized the economic opportunity, and in the 1850's began to grow tobacco for shipment to the Fall Line cities via rail. Subsistence agriculture in Southwest Virginia was replaced by a cash crop economy. Slaves were brought to Southwest Virginia to provide the labor. Though the percentage of slaves in the region was never as high as in the east, the overall economic, cultural, and political patterns in the region finally aligned with that of the Tidewater planters in the 1850's. When the Civil War came, the counties in Southwest Virginia with access to the railroad stayed loyal to the South. Though the number of slaveowners along the route of the Virginia and Tennessee Railroad was low west of the Blue Ridge, the mindset of the dominant class in Southwest Virginia was comparable to the mindset of the elite east of the Blue Ridge. During the Civil War, Southwestern Virginia furnished its share of soldiers. One lawyer from Bristol, John Mosby, came north to fight with Jeb Stuart and ultimately lead his own band of partisan rangers. Others contributed without leaving home. Workers at Saltville increased production of salt for the Confederate states. A clue to the integration of Southwestern Virginia with the rest of the state is that areas that suffered from Yankee cavalry raids, including Saltville and Pulaski and Radford, did not become disaffected or disloyal to the Confederacy. In contrast, East Tennessee remained a Union-leaning section of that state throughout the war. Had the Compromise of 1850 eluded the politicians and the Civil War had occurred 10 years earlier, Southwest Virginia might have joined with other western counties into an enlarged version of West Virginia. The residents of counties on the Appalachian Plateau further north lacked a railroad and did not develop a strong economic tie to Richmond, and those counties were incorporated into the new state of West Virginia. Transportation improvements could still transform the region. Proposals for economic development in Appalachia often start with "we need better roads." The Coalfields Expressway in the Appalachian Plateau, from Pound in Wise County to Interstate 77 at Beckley, West Virginia, is just the latest attempt to jump-start local growth by reducing the costs of transportation. However, new highways to "open up the region" are expensive. 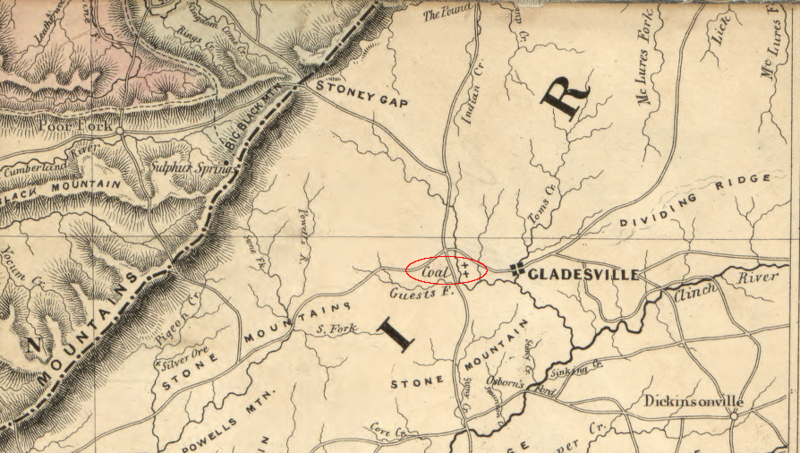 To expand US 460 through Grundy, the state had to move the entire town up to a new plateau, away from the river. Employment associated with the extraction of natural resources is declining. With automation, there is little demand for coal miners, even before the underground coal finally is mined out. The railroads are equally automated. The large switching and marshalling yards in Appalachia and Norton are historically fascinating, but economically irrelevant. Forest products have limited potential. Chipping raw material for manufacturing oriented strand wood products (chipboard) will provide only a handful of jobs. In addition, companies headquartered in Richmond (such as Pittston Corp.) or "up north" have not reinvested profits from operations in Southwest Virginia into the local community. Stockholders who rarely live in Southwestern Virginia have been the beneficiaries. One scenario hopelessis that the cities and suburban counties around Virginia's urban centers will grow, high school graduates from Southwest Virginia will move away for schools and jobs, and Southwest Virginia is destined to wither on the vine. However, all trend lines are not reliable. Just because Southwest Virginia has always been isolated physically from population centers and market cities does not mean the circumstances won't change. With the advent of the Internet, there may be a cost-effective way to connect the region to other areas. Fiber-optic lines are easy to string through the mountains. Southwest Virginia can be just as close to Chicago and Paris and Tel Aviv and Buenos Aires and Baghdad as New York, Washington, San Francisco, etc. Under these circumstances, being in a population backwater could be an advantage. Tiny counties in the mountains, not just in the Southwest but also like Bath and Craig and Highland counties, could pitch their natural beauty, reliable workforce, relaxed way of life, easy commutes, and other characteristics of a rural community as advantages. According to Thomas D. Reed, Ph.D., Genomatix Chairman and Chief Science Officer, the company has spent almost two years considering relocation options in the Eastern United States. 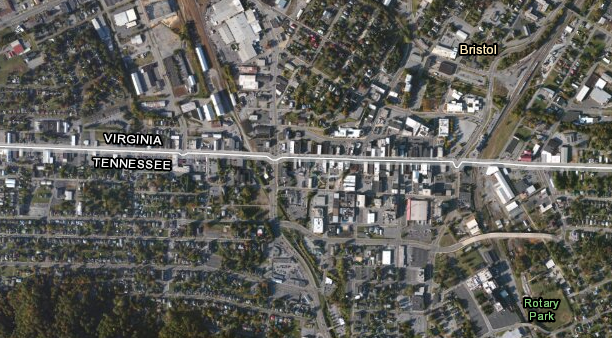 "We selected the Roanoke/ Blacksburg area for several reasons," said Reed. "Many of our existing and potential customer and partnering relationships are located within an extended life sciences corridor that runs from Upper New Jersey, south to the Atlanta/Birmingham area. Roanoke positions us close to the middle of that corridor, with the added advantage of being in direct proximity to Virginia Tech and UVA-Charlottesville, both of which are very strong life sciences institutions." ...Reed concluded, "We also couldn't help being attracted to the natural beauty of Southwestern Virginia. All of us are excited to be here and enjoy our first summer in the New River Valley region." The best example is the creation of call centers in communities in Southwest Virginia. The Communications Workers of America Local 2204 represents the Verizon employees in Dryden as well as Norton - the boundaries of that local stretches all the way east to Roanoke. Former Representative Rick Boucher from the Ninth District was a major leader in Congress in writing new telecommunications law, and Verizon was a major campaign contributor until he was lost the seat to a Republican challenger.